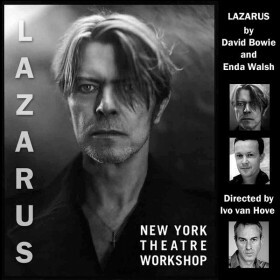 Lazarus, the new musical co-written by David Bowie, doesn’t open till Dec. 7, but – Bowie groupies that we are – we managed to snag last-minute tickets to one of the sold-out previews at New York Theatre Workshop. While it’s too early to review the play, co-written by Enda Walsh (Once) and directed by Ivo van Hove, we can’t resist sharing some of what we’ve learned about this trippy production starring Michael C. Hall as the Bowie character from The Man Who Fell to Earth. Read ahead if you don’t mind a few spoilers.